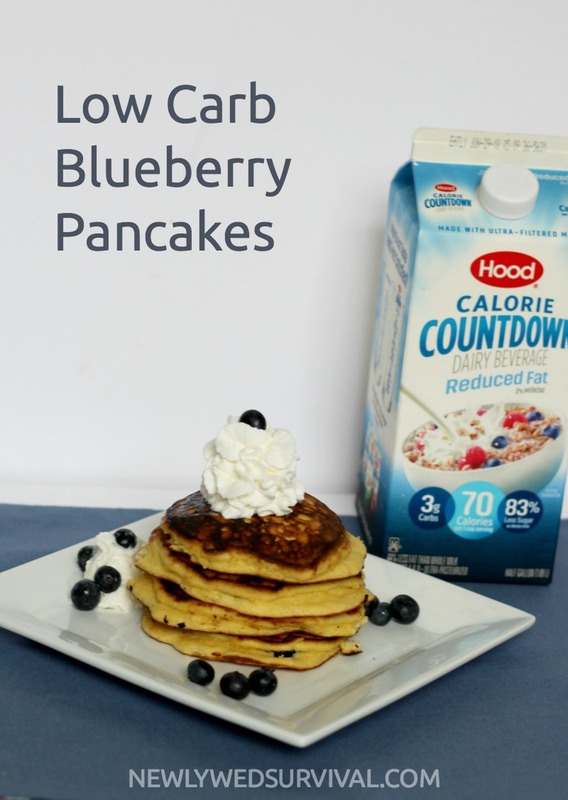 This recipe post for low carb blueberry pancakes was sponsored by Hood as part of an Influencer Activation for Influence Central and all opinions expressed in my post are my own. 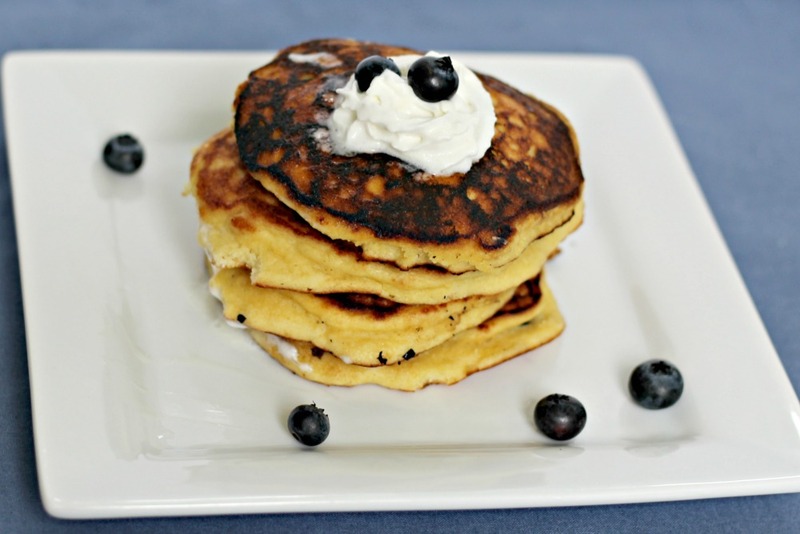 These delicious low carb blueberry pancakes are extra thick and very filling! 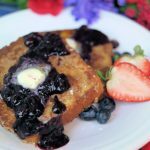 Combine all ingredients (except blueberries) until dry ingredients are incorporated into the wet. Spray griddle with a non-stick spray or coat with melted butter or coconut oil. 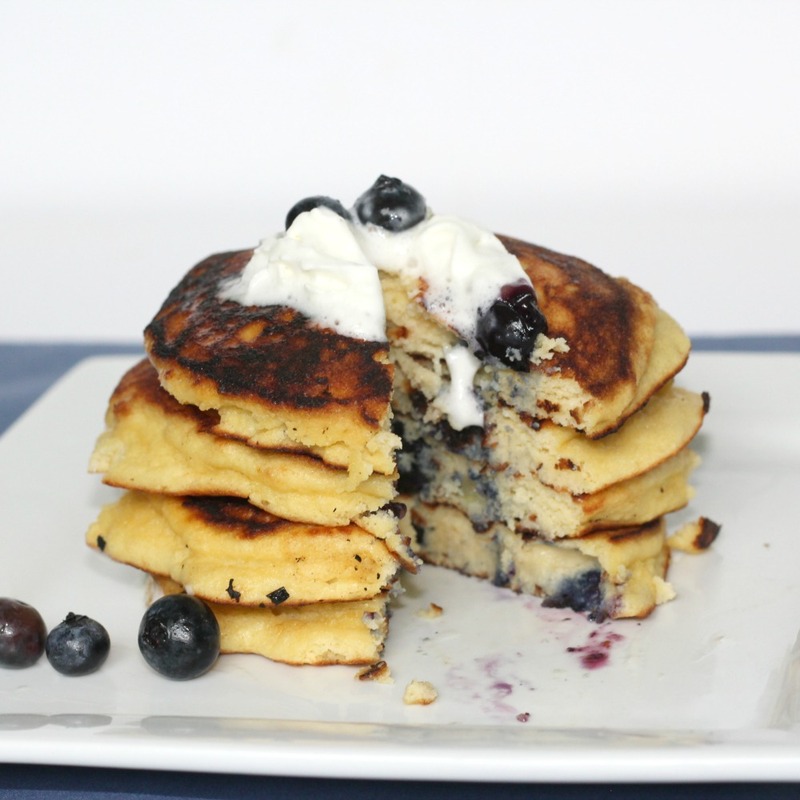 Pour the batter onto the griddle forming a 5-inch diameter pancake. Add blueberries and lightly press each one down. When the edges of the pancake start to look cake-like, flip the pancake and let it heat for another 30-60 seconds. As you can see, this makes for a much more satisfying pancake that will keep you full for quite some time. I like to use maple syrup in my recipe to give it the maple flavor (since I don’t use maple syrup to top the pancakes). 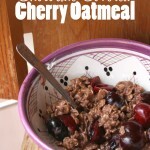 However, you can reduce the net carbs to around 5 if you use 6-9 drops of liquid Stevia to replace the maple syrup. 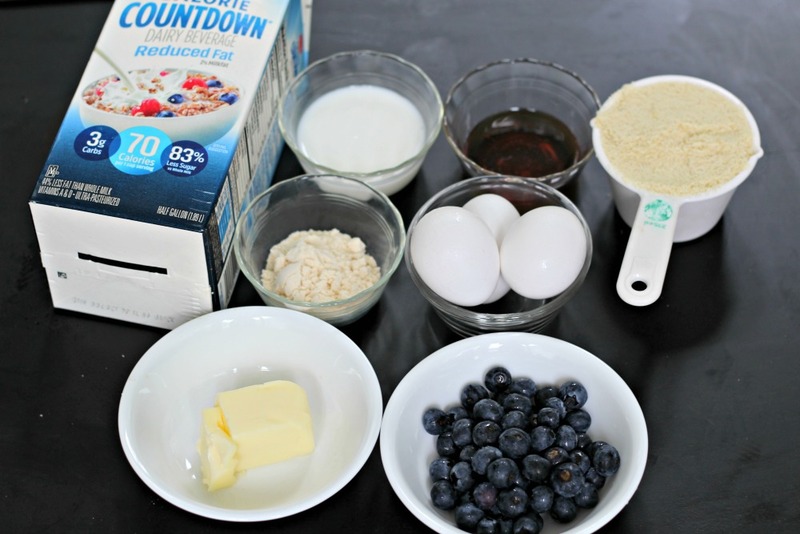 A great way to reduce the carbs in a recipe is to replace milk with Hood Calorie Countdown. 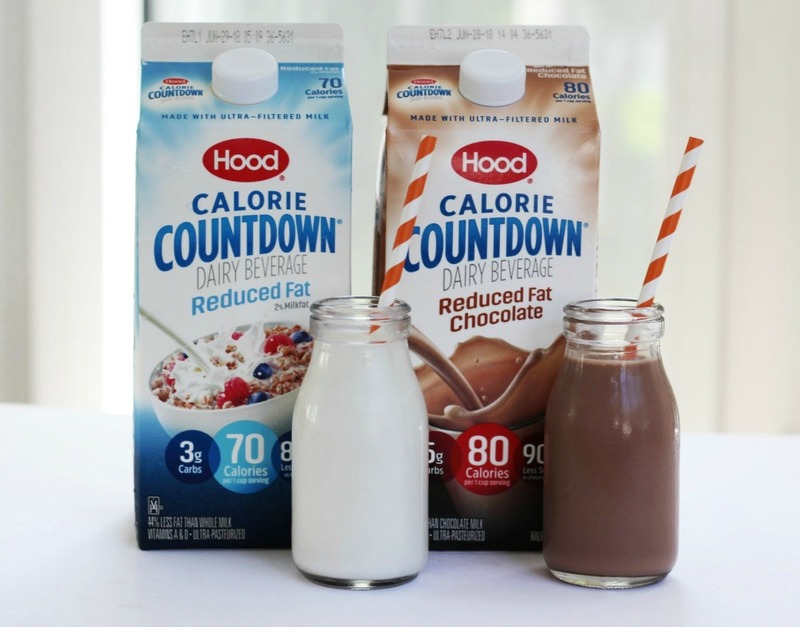 Made with milk from farmers who pledge to not use artificial growth hormones, Calorie Countdown is a delicious dairy beverage and is a great low carb alternative to milk. The blend of ultra-filtered milk, cream, water and other ingredients in Calorie Countdown provides a really creamy taste with less sugar than regular milk. This makes it perfect for use in recipes in addition to being a great drink. Make sure to try all 4 varieties of Calorie Countdown (Whole, Reduced Fat, Fat-Free, and Reduced Fat Chocolate ) to find your favorite! Are you trying to reduce your carbs? Or maybe you just want to live a healthier lifestyle? You should check out Hood Calorie Countdown for yourself. Right now you can download a coupon for $0.75 off of one Calorie Countdown dairy beverage and save. 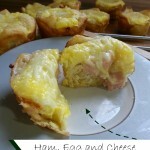 Plus you can get more great recipes using Calorie Countdown here! 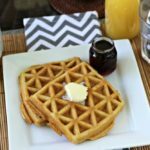 What is your favorite low carb breakfast recipe? I’d love to get more ideas! 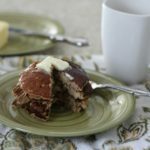 Apple Cinnamon Pancakes – No Flour Needed!